The “Me Too” movement has shaken the workplace to its core. It has such power that it has come to mean more than sexual harassment. “Me Too” is now also about the issue of unequal pay between men and women. According to the U.S. Census Bureau, a woman made 60 cents for every dollar made by a man in 1960. 40 years later, in 2000, that gap had been narrowed by just a dime. And it has taken nearly two decades more to shave another dime off the gap. Today women still make 20% less on average than their male counterparts. A tech company called Salesforce is the perfect example of just how tough it can be to close the remaining pay gap. Salesforce is huge – 30,000 employees, $10 billion in annual revenue – and it was just ranked by Fortune as the number one best place to work among big companies. That helps explain why founder and CEO Marc Benioff was so cocky when the woman who runs his human resources department came to talk to him in 2015 about equal pay. Lesley Stahl: So, when Cindy Robbins came to you and said, “Do you know we may have a problem with unequal pay in the company?” what was your reaction? Marc Benioff: Well, I said, “That’s not possible here.” You know, it’s– it’s not possible. Lesley Stahl: — Why was it impossible? Marc Benioff: It’s impossible because we have a great culture here. We’re– we’re a ‘best place to work.’ And we don’t do that kinda thing. We don’t play shenanigans paying people– paying people unequally. It’s unheard of. It’s crazy. Crazy because Benioff had already made promoting and retaining women a priority at Salesforce. But personnel chief Cindy Robbins says he’d never ordered an audit to make sure men and women were being paid equally. Lesley Stahl: Did you suspect that there was a problem? Lesley Stahl: And the assumption was it was true in all companies at that point. Lesley Stahl: So did you agree to the audit just to prove to her that she was wrong? Marc Benioff: I– I (LAUGHTER) really felt that there’s no way that this can be true. 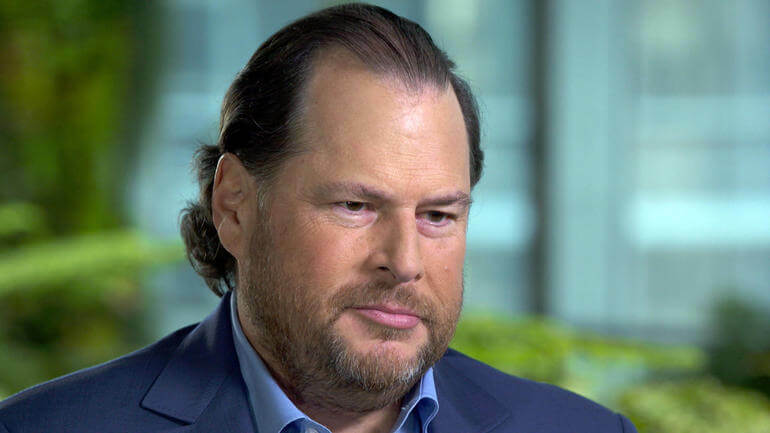 Marc Benioff: I said, “Well, we have to do it.” You know, she– she actually-she said, “Well, do you agree that we’re gonna pay men and women equally?” I said, “Of course I agree.” “Well, you– you know that– what– what it’s gonna cost you, don’t you?” “I don’t know, what is it gonna cost me?” “Well, I don’t know. You have to agree first.” So, I said, “Okay, — I agree. I agree.” All right, let’s do this. So they did the audit, and Benioff found that Salesforce did have a persistent pay gap between women and men doing the same job. Lesley Stahl: And it was widespread? It was a lot of cases? Marc Benioff: Just everywhere. It was through the whole company, every division, every department, every geography. Lesley Stahl: So how did you remedy that? Marc Benioff: We said we’re gonna pay men and women equally at Salesforce, and we’re gonna go through and we’re gonna level set every job and every divi– division, every department. And we’re gonna make sure that we have gender equality. Lesley Stahl: So when you went to correct, how much did it actually cost? Cindy Robbins: It– it cost about $3 million for us to do those adjustments the first year. More than 10% of the women at Salesforce got bigger paychecks. As a pioneer in cloud computing, Salesforce was already a powerhouse at the time – the fastest growing software company ever. I50,000 companies use its products to manage every detail of their relationship with their customers. One of the reasons it’s considered such a great place to work is that, from 1999, when he founded the company, Benioff has emphasized philanthropy and social responsibility. He pays employees to give their time to local schools and charities, and Salesforce has donated more than $180 million to non-profits. Lesley Stahl: Why do you think, given your culture, why do you think it happened here? Marc Benioff: I think- it’s happening everywhere. Lesley Stahl: But why particularly here and why is it happening everywhere? Ellen Kullman: I think what he’s doing is absolutely phenomenal. And he is committed. Ellen Kullman is the former CEO of DuPont, and now co-chairs an organization of high-powered businesswomen pushing for equality in the corporate world. Ellen Kullman: Our daughters are facing the same issues that we faced early in our career. And we made a decision that unless people like us did something about it, who would? What they did was form Paradigm for Parity, which basically tries to jawbone big-company CEOs into closing their gender gaps. Ellen Kullman: What we’re saying is they should have gender parity at senior leadership in the company. That means 50% of your most senior leaders are women. Ellen Kullman: So pay’s an outcome of an un-level playing field. Until you level that playing field, you’re gonna get that same outcome. Lesley Stahl: And these would be the leadership meetings. Lesley Stahl: But that meant giving everybody promotions. Cindy Robbins: Not necessarily. It meant identifying who the high potential women were. Cindy Robbins: So a door opened. Our job was to stay invited to these meetings, going forward. Technology companies are notoriously male-dominated, both in their overall workforce and in management. So achieving power parity in Silicon Valley is a struggle. Lesley Stahl: So what percent of the leaders in this company are women? Cindy Robbins: 20% of our leadership are women. Lesley Stahl: What would you like? Cindy Robbins: –I’m a woman, you know? I’m an (LAUGH) executive. Lesley Stahl: Did you yourself, in your career, ever discover that you were being paid less than a man who was doing a comparable job? Cindy Robbins: You know, there were times in my career where I said, “I don’t know if this is the right pay. And I kind of thought, “Well, if I say something it’s gonna go up the chain.” And do I wanna be viewed as the complainer? Right? Lesley Stahl: This is so what women across the board fear. Women are afraid to ask for a raise. This is a huge problem that we have. Marc Benioff: This is part of a total package. You can’t look at one of these things independent of the other. You know, at some point you’re gonna ask me about #MeToo. Because that’s the fourth door. You know, you can say equal opportunity is one critical part of gender equality. Then you can say equal advancement, that’s a critical part of gender equality. Then you can say equal pay, that’s the third door. And the fourth door is preventing sexual harassment. All of these things together is gender equality. One recent case of gender inequality in Hollywood got so much attention that it ended up in Jimmy Kimmel’s monologue at the Oscars. Jimmy Kimmel: And we all know the story: Mark Wahlberg was paid a million and a half dollars to re-shoot his scenes, while Michelle Williams, for her re-shoots, got per-diem. She was paid $80 dollars a day for the same thing. Lesley Stahl: We had the #MeToo women speak up, and now we’ve had a rash, small rash, but a rash of women speaking out and saying, “I’m not paid the same.” It’s interesting that it’s coming at the same time as #MeToo. It– it’s as if women are gaining muscles. When Ellen Kullman was running DuPont, she found that one thing holding women back – especially when it came to promotions – was unconscious bias. Ellen Kullman: And the perception is, do they need longer in a job to prove themselves as opposed to a man? We were promoting women every 30 to 36 months into same kinda jobs as we were promoting men every 18 to 24 months. So if you go out ten years, they’re being paid vastly differently. Lesley Stahl: I’m gonna read you a statistic. When men had children, their earnings went up 6%. So they’re rewarded for being a father. When women have children, their earnings decrease 4% with each child. Ellen Kullman: Unconscious bias. The assumption that they’re not committed. The assumption that they won’t be there when you need them. Bias Training: Our example is: Shannon is the proud parent of a new baby boy. Some companies are now offering their employees unconscious bias training sessions in which facilitators try to help people identify attitudes they may not even know they have. Bias Training: Shannon is a woman who returned to work last month after taking maternity leave. The assumption is, Shannon will be tired, not able to give work her full attention. And the conclusion is I’d better not give Shannon any challenging tasks. She won’t be able to concentrate. That’s the so-called mommy penalty. At salesforce they have worked to address it by offering on-site daycare, generous family leave, flexible schedules, and now, equal pay. But Benioff has found out just how hard bringing that about really is. Marc Benioff: We did it the first time. We were so happy with ourselves. It was great. Then all of a sudden we kind of did our audit again and the same thing happened again. We’re, like, “How can this be?” But it turned out we had bought about two dozen companies. And guess what? When you buy a company, you just don’t buy its technology, you don’t buy its culture, you also buy its pay practices. Lesley Stahl: So they would come in and the men were paid much more and then that got eaten up into your statistics, into your audit. So you had to redo the whole thing all over again, costing as much as the first time. Marc Benioff: It cost us as much as the first time. In total, it’s now cost us $6 million. Marc Benioff: More than every year. We’re gonna have to do this continuously. This is a constant cadence. You’re gonna have to constantly monitor and keep track of that, but that’s easy today. We run our company the same way every company is run with computers and technology and software. What do you think, that we’re– running our pay scales on 3×5 cards? Benioff’s become a national figure, an activist CEO who takes public positions on controversial issues. In 2015, he threatened to pull Salesforce investments from states that passed anti-gay or anti-transgender laws. Now his cause is equal pay for equal work. Lesley Stahl: This is your passion. Marc Benioff: This is part of who I have become as a leader, that I believe as a CEO that I can show other CEOs how to create a great culture in their company. You can’t be a great CEO and say that I’m not committed to gender equality today. I– I don’t think it’s possible. Lesley Stahl: Look at your own numbers. Marc Benioff: Look at your own numbers. For many years, CEOs have publicly embraced the concept of equal pay, but then complained about how hard it is to get there. Remember that prediction that it’ll take 100 years to get to pay parity? Lesley Stahl: 100 years, really? Marc Benioff: Oh, it’s crazy, isn’t this? Marc Benioff: This is ridiculous. Lesley Stahl: It won’t take 100 years, or will it? Marc Benioff: Well, you know, I mean there is a lot of resistance. But this– there’s never been an easier time to make this change. CEOs with one button on one computer can pay every man and every woman equally. We have the data. We know what everyone makes. There’s no excuse. Everybody can easily do this now. Produced by Rome Hartman. Associate producer, Sara Kuzmarov.